The Starr Company of Canada head office, located in London, Ontario, was the wholesale distributor of Starr records and phonographs in Canada, active between 1917 and 1925. Ongoing research by Douglas Flood of the London Lombardo Museum, Mike Baker of Museum London, Alan Noon of the University of Western Ontario, and Arthur McClelland, London Public Library, has uncovered new facts and stunning photographs of the London operation. There was a connection to the Starr Piano Company in Richmond, Indiana, and to Herbert Berliner’s Compo record company in Lachine, Quebec. Two London "old boys", John A. Croden and Wilfred D. Stevenson, were responsible for the Starr Canada office. In 1917, after successful careers in the piano industry, they launched the Canadian Phonograph Supply Company, importing records and phonographs from the Starr Piano Company in Richmond. In early 1918, they changed the name to Starr Company of Canada. The next year, the Dominion government introduced a prohibitive tariff on imported manufactured goods. Consequently, Fred and Harry Gennett collaborated with Croden and Stevenson to shift manufacturing operations to Canada. In 1918, Herbert Berliner moved some discarded record presses from the Berliner Montreal factory to his new Compo record factory in Lachine. In early 1919, he began pressing American Starr-Gennett masters in Lachine for Starr Canada. The following year, Croden visited England and Europe, returning with "mothers" to be pressed by Compo for Starr. Early Starr labels were printed with a large "Gennett" logo, surrounded by a scrolled hexagon, and "Starr Co. of Canada, London, Ont." in gold lettering at the top. Steven Barr, author of The Almost Complete 78 rpm Record Dating Guide, has written about these various dark blue, black, and red labels, all with gold type. 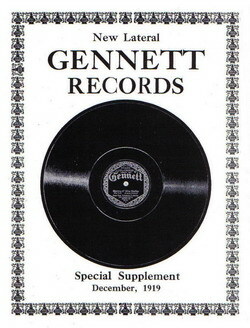 The February 1920 Canadian Music Trade Journal stated that Fred Gennett, head of the Richmond factory, visited Stevenson in London to set up three plants to manufacture phonographs. 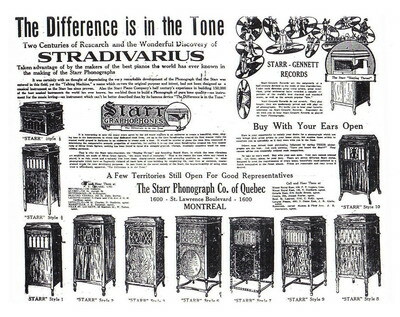 Canadian-made Starr phonographs, as well as U.S. models, were made in the styles illustrated here. For a brief period in 1925, London’s W. D. Stevenson became Vice-President of Starr Piano Company in Richmond, the first non-Gennett family member to hold an administrative position. Arthur Zimmerman introduced us to the Standfield-Macpherson Starr dealership in Toronto (APN July-Oct 2006). In 1917, Melville Standfield was recruited by the London office to establish Starr agencies in Western Ontario. In 1918 he travelled to British Columbia. By the Spring of 1920 Starr stores appeared in all major cities from the West to the Maritimes. By March 1922, at the height of its record sales, there were 101 Starr dealerships in Toronto alone. The full story of the Starr Company of Canada will be presented in an upcoming article in the CAPS newsletter.